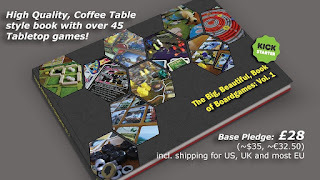 The Big, Beautiful, Book of Boardgames" shares the love of tabletop games in a coffee table style hardcover book, including over 45 games. Each game is featured across four pages, showing the layout, components, artwork and mechanics at play. This setup matches a game already midway in play, so readers can get a real feel for each game. The intention in publishing this book is to grow the interest to those who might not yet be gamers, as well as to provide a great addition to the collection of existing gamers - something to thumb through during the time between game sessions.